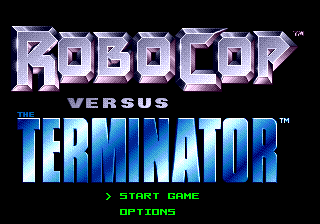 RoboCop Versus The Terminator (ロボコップ ＶＳ ターミネーター) is a sidescrolling shoot 'em up that combines elements from the Terminator and RoboCop movie franchises similar to Aliens vs. Predator. The story was largely based on a comic book of the same name, though elements may have been taken from a script for a feature-length film (which was later cancelled). The SNES version, which follows the story of the comic book adaptation written by Frank Miller, has a slightly different story, a more cartoony look as well as different stage layouts and enemies. Japanese Mega Drive version also uses the comic book's cover. Sega Mega-CDMore... and NES versions of the game were planned, but cancelled. The player controls RoboCop, who has re-assembled himself in the future to stop Skynet. With a variety of weapons he must defeat numerous Terminators in an attempt to save the future. There is also a fight with an ED-209 from the RoboCop series. is for switching weapons, two can be carried simultaneously, with the currently inactive weapon being replaced by a new one. fires and jumps. The game has a slow autofire function, tapping the buttons can drastically increase fire rate. There is no shot rate limited in place, the rate is controlled by the bullets on screen at the same time, so some bosses can be defeated easily by point blanking and using autofire. Certain enemies have specific weaknesses, e.g. standard Terminators are weak against the plasma rifle. The numer of onscreen bullets can become very high in later stages, with only the flame thrower (which resembles the spreadshot from the Contra series) being able to destroy certain enemy bullets. There are also a number of secret rooms. The game keeps a score. but it can be cheated, e.g. by entering the bonus stage accessed from stage 2 repeatedly, which resets all enemies, items etc. The game seems to reuse certain graphics from the Mega-CD version of The Terminator, such as the spider enemy. Main article: RoboCop Versus The Terminator/Magazine articles. Main article: RoboCop Versus The Terminator/Promotional material.